We have introduced many nice protective cases for iPhone 5, but if you like taking photos with your iPhone or want a handy way to charge the iOS device, the following ZOpro iPhone 5 case may be more suitable for you.ZOpro is a multi functional protective case designed for iPhone 5. As we can see from the images, the iPhone 5 case features ultra thin, two-piece design, and the hardshell construction effectively protects your iPhone 5 from bumps and scratches. Moreover, the iPhone 5 case also features an integrated sync & charging cable in the bottom part. Just removing it from the iPhone 5 case, you can conveniently connect it with your iPhone 5 for charging or syncing. And the iPhone 5 case comes with two iPhone lenses including fisheye, wide and macro, using unique OZ system, you can easily attach the iPhone lenses on your iPhone 5. Apart from that, the iPhone 5 case also ships with a versatile iPhone stand that not only holds your iPhone 5 i landscape viewing mode, but also doubles as a tripod mount for any standard tripod, while the removable handle makes your shooting more stable. 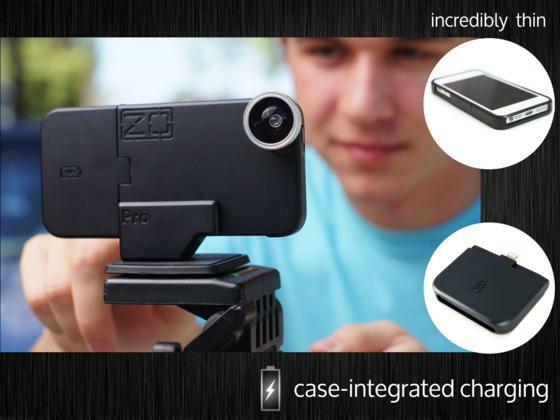 At present, the inventor of ZOpro is raising fund at Kickstarter. Pledging $60 will let you own the iPhone 5 case set. If you’re interested, jump to Kickstarter official site for more details. Additionally, also don’t miss other nice options via “iPhone 5 case” tag.